Two weeks ago I posted 10 Uses for Baking Soda and today I am sharing 15 uses for vinegar. The two work together very well and are super multitaskers! Save space and money buy cleaning with vinegar. Clean the Refrigerator – Mix equal parts hot water and white vinegar and wipe the interior of the refrigerator. This will deodorize as well as clean. Don’t forget to leave a box or dish of baking soda in the fridge to absorb odors. Remove Stickers, Decals, and Labels – Remove labels and stickers from glasses by soaking sticker in white vinegar and scrub away with sponge. Be mindful of the surface. Clean the Microwave – Place a microwave safe bowl full of 1/4 cup white vinegar and 1 cup water. Microwave on high for 5 minutes and wipe clean with a damp cloth or sponge. Cut the Grease – Use vinegar to cut through grease in the kitchen. Unclog a Shower head – To clear up your shower head, all you need is baking soda, white vinegar, a plastic bag, and a twist tie. For instructions check out this site. Trap Fruit Flies -Add balsamic vinegar to a small bowl and cover tightly with clear plastic wrap. Poke small holes in the plastic wrap and place in the middle of the kitchen. The flies will find their way in but won’t be able to escape. 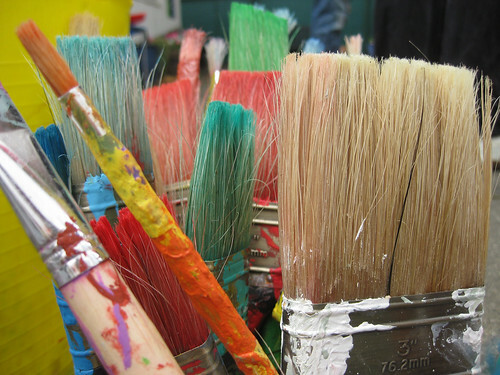 Renew Paintbrushes – Soak old paintbrushes in white vinegar, then clean with soap and water. Streak-less Windows – In a spray bottle mix equal parts white vinegar and water. Spray window and wipe clean with a clean cloth. Dye Easter Eggs – Mix 1 teaspoon of vinegar with each ½ cup of hot water, then add food coloring. Soak eggs until desired color is achieved and allow to dry. Deodoerize Travel Mugs – Fill travel mugs with white vinegar and a bit of water, soak overnight and wash as usual. For stubborn odors, scrub inside with a paste of baking soda and water, rinse, and soak vinegar. Kill Germs – Spray full power white vinegar on surfaces and wipe clean. Create a Volcano – I can still remember, as a kid, combining red food coloring, baking soda, and vinegar for an explosive lava reaction. Kill Weeds – Pour full strength white vinegar on weeds or grass. This works best for cracks on the sidewalk. Wash Vegetables – Mix 1 tablespoon of white distilled vinegar in 1 ½ quarts of water and use to wash fresh veggies. Salad Dressing – Put together a quick salad with oil and balsamic vinegar or follow this recipe.